The maker of cannabis extracts finished a whipsaw session 40 per cent higher. That’s a great day for any stock. But Tilray was up as much as 94 per cent, peaking at US$300.00 at 2:50 p.m. in New York. Fifty-three minutes and four trading halts later, it was negative. The closing flourish that added US$63 to the share price took just six minutes. The stock’s wild ride Wednesday is emblamatic of the mania surrounding pot stocks, drawing comparisons to last year’s crypto craze that sent investors pouring into Bitcoin and its ilk. 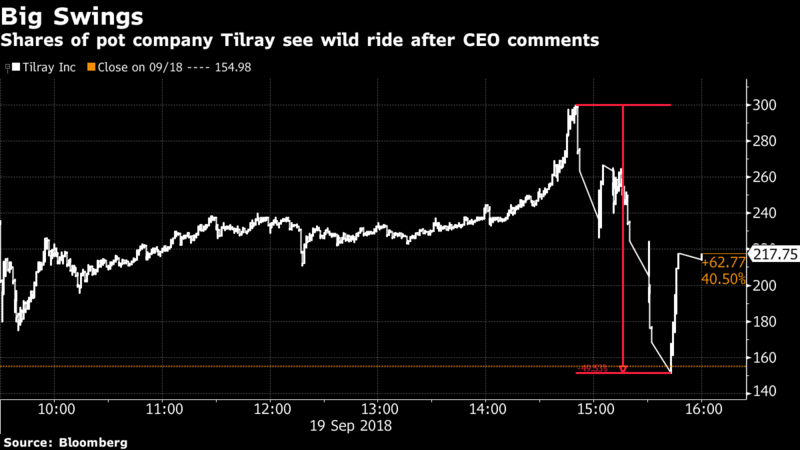 Tilray rallied to more than 14 times its July initial public offering price, making it one of the best IPOs in the past decade. The company has a market value that exceeds some mainstream stocks, including American Airlines and Clorox. About US$5.9 billion worth of shares traded hands Wednesday, behind only Amazon’s US$6.1 billion; the stock’s dramatic move triggered at least four halts for volatility. Tilray soared Tuesday after announcing the U.S. DEA approved plans for it to import medical marijuana to supply a clinical trial in California; the stock has gained 42 per cent this week and more than 1,100 per cent since its trading debut in July.